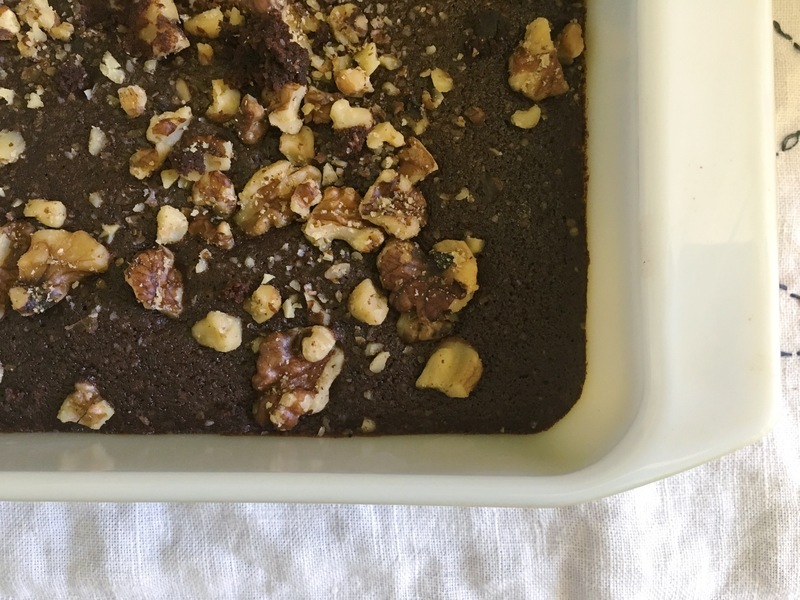 The most delicious way to use up leftover nut milk pulp is to make rich, decadent brownies. The milk I make is 3/4 cup cashews and 1/4 cup almonds, so my pulp is the same ratio. I used to make only cashew milk, but I think adding almonds gives homemade milk a more complex flavor. Also, cashews don’t make enough pulp for a recipe of brownies and I would always end up sacrificing the moldy pulp to the compost gods. Luckily, two batches of cashew-almond hybrid milk makes just about enough for one brownie recipe. This is the only photograph I got before the pan was consumed. They are difficult to ignore! I followed this recipe from Bojon Gourmet and added walnuts on top, simply because that was the amount that didn’t fit into my jar. I do not enjoy walnuts in my brownies, but I found out I like them on my brownies! I own compostable parchment paper, but try not to use it, especially when I know I’ll have to wash the pan regardless. All ingredients can be found in most bulk areas, making this an indulgent yet guilt-free zero waste dessert.